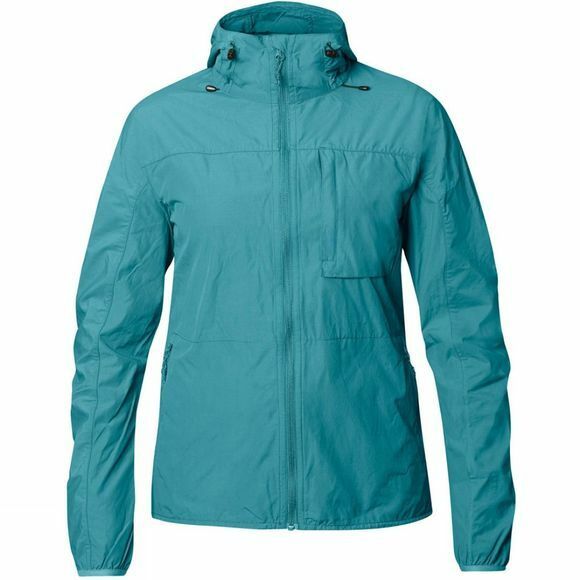 Lightweight and and packable, the Womens High Coast Wind Jacket is wind and water resistant thanks to Fjällräven's waxed nylon/organic cotton blend. The fabric can withstand light rain as well, and it dries fast should it get wet. It's a practical garment that can be pulled on when needed, and it's versatile too; suitable for walking, paddling and cycling. A simple design has kept only the most essential details in order to keep weight at a minimum. The jacket has a well–fitting adjustable hood and zip at the front with an inside protective flap. The left–hand vertical chest pocket keeps small items close at hand, while sleeve cuffs with elastic edging and a drawcord adjustment hem tailor the fit.